Dr Gunnar Beck is an EU lawyer and legal philosopher. He teaches courses in EU law and our undergraduate course in legal methodology and systems (ILLP). He is also the convenor for the MA in Law presessional course in legal methodology and reasoning. At present Gunnar is engaged in a study entitled "The European Court of Justice and Legal Reasoning". Gunnar has published numerous academic articles in EU law, legal and political philosophy. From early 2002 to 2004 Gunnar was legal adviser to the UK parliamentary delegates at the Convention on the Future of Europe and as one of the UK delegates to the Collaborateurs Cttee of the Convention. Gunnar also worked as an employed barrister in the EU & Competition department of the London-based international law firm Herbert Smith. He previously taught at the University of Oxford and the London School of Economics where he was a part-time lecturer in EU law, jurisprudence and political philosophy. Gunnar has provided legal advice to the European Scrutiny Committee of the UK Parliament. He is able to provide high level advice and representation on all EU law matters, including constitutional issues, competition law, extradition, EU environmental law, free movement and other specialist areas. Gunnar has particular expertise in EU citizenship and human rights law. Gunnar regularly presents seminars, lectures and other training sessions at leading City law firms on the EU Constitutional Treaty, the issue of Kompetenz-Kompetenz, the EU Reform Treaty, comitology and developments in EU citizenship and human rights law. 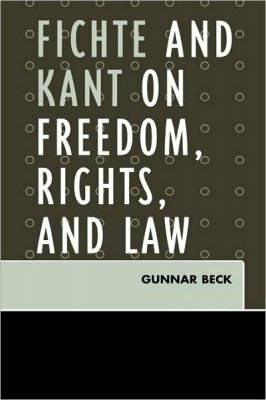 Beck provides the first comparative book-length introduction to Kant's and Fichte's theories of freedom, law, and politics, together with an overview of the metaphysical and epistemological edifice underpinning their thinking. He provides a critical analysis of the underlying normative foundations of Kant's and Fichte's theories of rights as the central theme around which the broader discussion is structured. The School of Law at the School of Oriental and African Studies conducts a vigorous programme of teaching and research in comparative and international law. Lecturers in the School of Law are acknowledged experts in their fields and remain at the forefront of fostering both professional and interdisciplinary study. They maintain close links with professional practice and frequently have first-hand knowledge of the latest developments in business, government and international organisations.